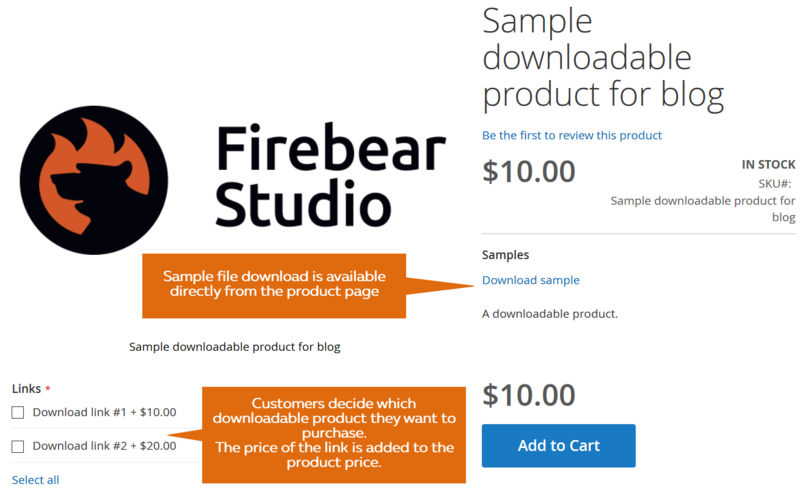 The complete guide to downloadable products, and how to import them is a part of the blog posts that FireBear team composed for you. From these guides you will learn peculiarities of the Magento 2 product and understand the basics and advanced methods of product import and export. Downloadable products are just like simple products with the only difference being that customers download such products directly from your store. All other settings and features are pretty similar. Just like with Magento 2 simple products you can add custom options, manage the product availability, etc. Downloadable products do not have complex architecture like configurable products, or require adding options as bundles. If you are reading this guide, you are probably familiar with simple products and how they operate in Magento 2. That’s why, not to waste your time we will focus on the differences of the downloadable products. Just like other Magento 2 product types, the downloadable products can be created at Catalog > Products section of your Magento 2 administrator panel. Click the dropdown button near the ‘Add Product’ button and select ‘downloadable product’. The downloadable product settings are the same as simple product’s. With the exception to Downloadable Information section. The first part of the section is dedicated to Links. In the Links section you specify the links to the downloads you will be selling. Here you can specify the link title, upload a file or specify a link to it, decide if you want customers to share the links, and specify how many times customers can download products. At the screenshot above, you have probably noticed that each link can have dedicated price. Yes, you can set specific price to every link you sell. This price will be added to the price of the downloadable product you have specified in the General product settings section. If the downloadable product price is $10, and you have set link price to $20, customers will need to spend $30 total to purchase a product. The second part of the Links section is Samples. 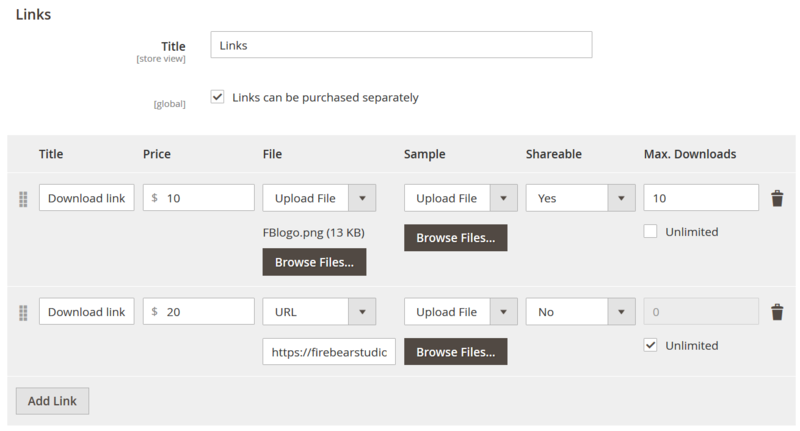 Here you can specify the links or upload samples of the files you are selling. 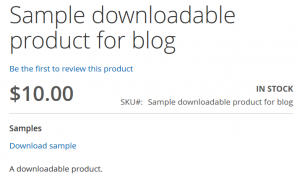 Customers will be able to download samples directly from the product pages. And that’s pretty much it. Once you are done with Downloadable Information section you can hit ‘Save’ button and see how the product performs at the frontend. You can see that every piece of the product settings we have filled in the previous chapter is now visible at the Magento 2 downloadable product page. When the product is purchased and the order is completed, customers can proceed to their account dashboard to download the products purchased. In My Downloadable Products section, customers can find all the links for the downloadable products they purchased. 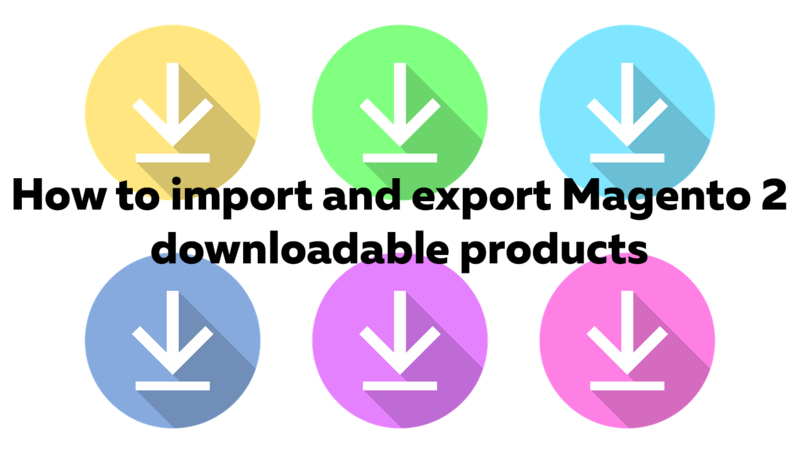 If the link has a limited downloads, the number of the downloads left will be displayed in the Remaining Downloads column. There are two way of importing and exporting downloadable products, and products in general. Using default Magento 2 import and export functionality and Improved Import and Export extension by FireBear Studio. With default Magento 2 import and export you can expect to handle products and customers. You will get a properly formatted CSV table with all products or customers from your store. All these entities and be both imported and exports along with products and customers. As for the import and export sources you will be able to import from: Dropbox, Google Sheets, FTP/SFTP, direct URL, Rest and Soap APIs. Meaning that you can integrate your ERP systems using API with the extension. In this guide we will be using Improved Import and Export extension as it allows to import downloadable product options. With default Magento 2 import and export you can also import downloadable products, the process is pretty similar without additional features though. So you will get idea how to use both tools. To export products using native Magento 2 export, proceed to System > Export. The process is very limited and simple. You choose the entity, and click ‘Export’ button. With Improved Import and Export, proceed to System > Export jobs. 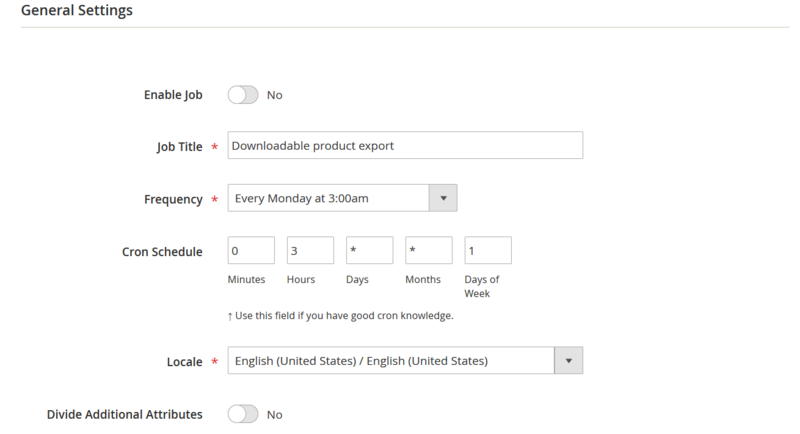 Here you can schedule the export job to run automatically, select the file format you want to get: XML, CSV, Excel, OpenOffice and define other unique features. For a full export guide refer to the extension manual. Both Magento 2 native import and Improved Import and Export support CSV file types, so let’s have an example in CSV. For editing purposes use Google Sheets, this is the most simple and convenient way of editing CSV files. The top row is taken by the product attributes, all the rows below are different products with the attribute values. You can find the full list of product attributes and their description in the Complete Import Guide. However, I advise to take a look at the Google Sheet Master Import Table we have composed for you. In this Google Sheets we have gathered all entities available for import into Magento 2. Every attribute in the table comes with the description, sample values and instructions on how to fill in the values, and what values can be accepted by Magento 2. In the Master Table you can also find a dedicated sheet for downloadable products. In this sheet you will find sample downloadable products with sample data filled in. When it comes to downloadable products and their import, the only difference they have from simple products in terms of attributes is the attribute downloadable_links. and want to name link ‘FB logo’. Try it out yourself and use the Google Sheet we have composed for you. That’s it. You now know how to compose downloadable_links attribute value. As for other product attributes and its values you can always refer to our Guide List and Master Table to learn how to compose values.